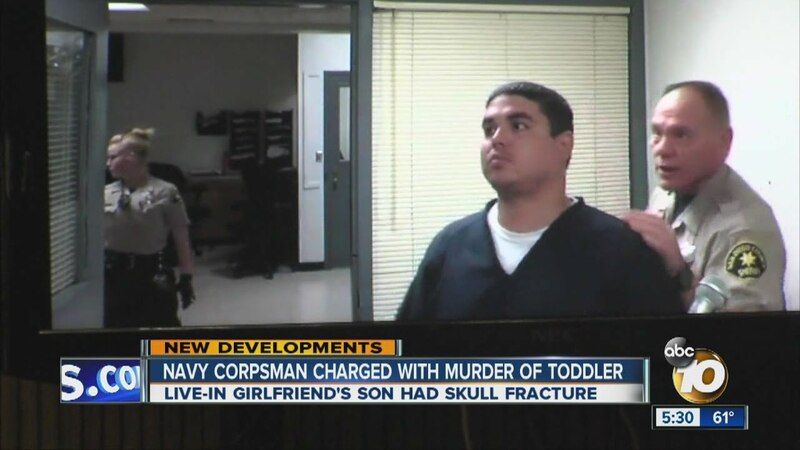 A Navy corpsman who inflicted fatal injuries on his girlfriend’s toddler son at their home in Alpine was convicted Wednesday of murder and assault on a child causing death. Jurors deliberated about two hours before finding 32-year-old Brett Brown guilty in the 2016 death of Lucas Orlando, who was 20 months old. Brown faces 25 years to life in prison when he is sentenced Nov. 28. Deputy District Attorney Chantal de Mauregne told the jury that Brown lied to his girlfriend, Renee Fournier, and first responders as to how the child was hurt. About 1:45 p.m. on Jan. 11, 2016, deputies responding to an emergency at Fournier’s apartment of Arnold Way found her son gravely injured, said Lt. Kenneth Nelson of the San Diego County Sheriff’s Department. Brown told deputies Lucas had been hurt in a fall. Fournier was at work at the time, Nelson said. Brown had been watching Lucas that day along with Fournier’s other child and two of his own from a previous relationship, Nelson said. Brown — a Navy corpsman on leave at the time — was arrested on Jan. 14, 2016. The prosecutor said the child suffered severe eye, brain and neck hemorrhages, skull fractures and a broken leg. Brown testified he was carrying the boy and a plate of food when he slipped and fell on top of the toddler. Fournier pleaded guilty to felony child endangerment and is scheduled to be sentenced Oct. 9.